No related code in MediaWiki-extensions-WikimediaMaintenance, hence removing tag. No error messages. Only freezing page for long tilme without any effect. Ok, this bug is now occured in the MediaWiki.org. 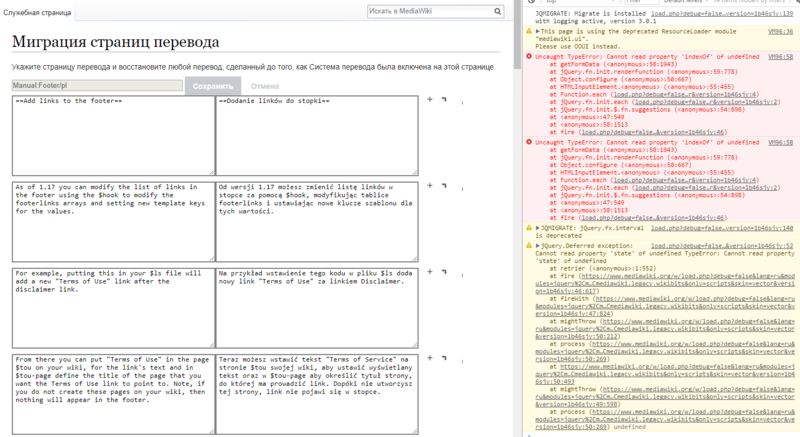 After some time, this bug is occured in the "Manual:Footer/ru "
How to trace or debug this problem? Completly nothing! This is best change! First of all, why did you decide that it is T139463, which introduced the bug? That patch made some changes to input fields text direction on that page, but this does not mean that it also broke saving. Anyway, I decided to investigate this problem using my local MediaWiki development instance. First of all, I ensured that it really does not work with latest versions of Mediawiki and Translate extension. Then after changing versions I made sure that @Goraf is right: the issue was caused by changes in Mediawiki core, not by changes in Translate extension. So I started some git bisect-ing in Mediawiki core and found out that this problem occured first after upgrading jQuery (T124742 and https://gerrit.wikimedia.org/r/#/c/322812/ ). And after upgrading jQuery the issue remained unnoticed. T139463 is not related to this problem. @Phantom42, very thanks for investigation and explanation! Happy New Year! No problems! Hope this will be fixed soon! (I may try to work on this if I will have free time available). Happy New Year too! I decided that I will find the issue and fix it. And add that to Translate\resources\js\jquery.ajaxdispatcher.js mentioned before. All I found. @Goraf thank you for links! I have just submitted a patch, hopefully it will get reviewed by somebody soon. If something needs fixing / imporving / being done another way - please tell and I will update the patch! Thank you for merging this! Hopefully we will get some feedback after deployment. If there are any other issues related to this - please tell and I will be happy to fix! @Goraf thank you, I will take a look at it!